The first day I was here, well, I looked out the back window and saw a mother there with her new baby, so I knew I was at the right place. I've looked at nursing homes, and when we get to the driveway and I see all the older people crumpled together, I told my son just to back out of there; I can't stand it--such a ghetto of old people. That's the thing I love here--all the different generations, all the little children. Agnes Myers leans out to the side of her motorized chair and pulls out another weed with her trowel. Agnes is on the gardening committee, and although she is 71 and has difficulty walking, she takes her turn keeping the weeds down. Three year old Allison, who lives above Agnes's apartment, runs outside to see what is going on. She puts her stuffed in the basket attached to Agnes's motorized chair and comes along to watch her work in the reservoir's garden. The Reservoir is a cooperative designed to meet the needs of an intergenerational mix of people. Parents can watch their children playing outside from the kitchen or dining room. The shared green with two play structures gives children a large area outside their door to run and play. For older adults and people with physical limitations, all first-floor units have been built without steps. Even the big front porches are at ground level. Four of the units are specifically designed barrier free. Light switches, the thermostat, door peepholes, and electrical outlets can be reached from a wheelchair; bathrooms are wide with a roll-in shower; and kitchen counters are open for wheelchairs to roll under. 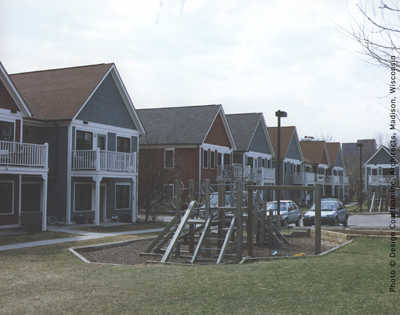 The twenty-eight dwellings are grouped into large "houses" of four-five and eight-plexes to fit into the neighborhood scale. Every four households share a central common room, used for meetings, socializing, and as a play area. Adjacent to each common room is a shared washer and dryer. All the households have access to a meeting room with a kitchen in the old livery, the only renovated building on the site. Funding for the Reservoir came from tax-exempt bond proceeds ($975,000), a city second mortgage ($345,000), MHA equity ($191,600), and city financing on land purchase ($81,000 plus interest earnings of $7,500)for a total of $1,600,110. Affordable housing was one of the main goals in developing the Reservoir. People with different incomes are mixed; a third of the apartments are for low-income people, a third for moderate incomes, and a third at market rate. Members pay a membership fee equal to one month's rent )plus estimated utilities) when they move in and pay carrying charges (similar to rent) every month under a leasing agreement with MHA. When they move out, this arrangement limits the equity members receive to their membership plus accrued interest, currently at 8.5%. New membership fees rise very little over the years. In addition to affordability, the mix of unit sizes, from 680 to 1,300 square feet, helps attract singles, single parents, and families. Residents like the downtown location, distance to downtown businesses, buses, and child care. The Reservoir is owned by a mutual housing association. MIutuals are a popular concept in Europe but not as well known in the United States, (see p. 198). The mutual establishes cooperatives by purchasing land, developing the housing, and training the first residents in cooperative management. Since it started in 1983, the MHA has developed cooperative clusters around Madison, including the Reservoir. All of the 206 units in these clusters share one board of directors and for legal purposes are considered one large scattered-site cooperative. The MHA and the cooperative are sister organizations but separate entities with separate boards of directors. The nonprofit MHA owns all of the land and the common improvements and leases it to the cooperative. The cooperative, controlled by members makes, makes membership decisions and deals with day-to-day management and maintenance in all twelve cooperative clusters. Both organizations gain through combining their forces. The MHA has a broad vision for the neighborhood and leverages its ownership of 206 units into loans to develop more housing. Its nonprofit status gives it access to reasonable financing from government sources. For example, the Reservoir was mainly financed through a tax-exempt bond, issued by the city of Madison in combination with two other MHA developments. The cooperative gains because it can help accomplish tasks that a smaller and isolated Co-op would find difficult, such as negotiating repairs at a cost discount because of volume.The cooperative can also subsidize repairs on older buildings from savings on newer buildings. On the minus side, the separate cooperatives give up some of their autonomy for their greater size. There are various levels of decision making in the cooperative, of which the Reservoir is one member. the highest is the cooperative board (with one yearly meeting of all the members) where policy decisions are made that affect all the buildings. Second is the resident council, one for each of the twelve cooperative clusters (members meet once a month and elect a representative to the board). In the Reservoir there is also another level of governance: meetings of four households once a month in their common room. The households discuss house rules, expenditures and activities. All decisions are made by consensus. So that new residents will understand the structure of living in a co-op, there is a 12 hour training program during their first three months of residency. The program covers their responsibilities as well as the history of the Reservoir, property management, finance, and decision making. One member commented, (the first time I came here I thought it was terrible; they had so many requirements and rules. But it's an experiment--we must work out how we will all get along". New members are chosen for their commitment to cooperative management.After a year, if a resident does not participate in the training or does not attend meetings, a renewal agreement can be denied. "This is better than a typical rental situation, because it's demanded of people that they talk to each other". "People really have to take responsibility for living here. Responsibility empowers people. Madison Mutual Housing Association's planning committee included the local nonprofit Design Coalition, Architects: Independent Living, and older-adults service provider Access to Independence, an advocacy group for people with physical disabilities; Options in Community Living, a group assisting people with developmental disabilities to live independently; the Salvation Army; a member from the Old Market Place neighborhood association; and two co-op members. Nine of the units have monthly carrying charges priced at 30% of a household's income whose income is 50% of the medium )HUD guidelines), nine of the units are priced at 30% of a household's income whose income is 80% of the median, and the remaining ten units are budgeted at market rents. The market-rate units help subsidize costs for the lower income units. If a resident's income changes from low to median income, the household does not have to move, but the allotment of available median income units is reduced and the allotment of available for low income units is reduced and the allotment for low income units is increased. The resident councils work out problems and decide on rules, new members, and items that need to be repaired. Part of the monthly carrying charges include a housing fund for repairs and maintenance that members decide together how to spend. Davis, Martha, 1989. Cooperative Housing. A Development Primer. Washington, D.C.: National Cooperative Business Association. Hobart, Susan. 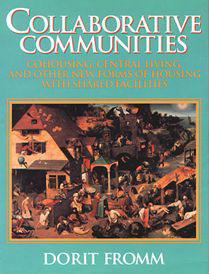 1988 "The Reservoir Cooperative: Developing One American Co-op. In Women and Environments 10 (Spring): 16-17. 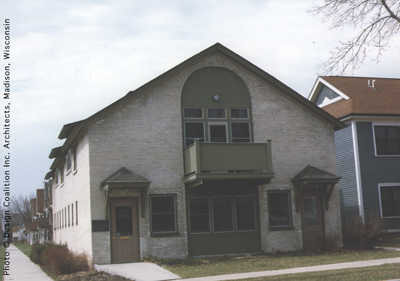 Madison Mutual Housing Association". 1986. Economic Development and Law Center Report (issue on women, Spring 1986)" 31. Martell, Chris. "Miracle at the Reservoir." Wisconsin State Journal, February 5, 1989, p. 12G.